Fall has Begun! We are hosting our 5th annual Halloween Daytime Trick-or-Treating Event and Costume Mini-Session on Saturday October 28th, 2017. I love seeing all the children year after year knock on my door in their adorable little costumes. Whether it's something amazingly intricate that Grandma made, or a quick costume you bought from the grocery store, we always have a lot of fun in the studio taking all kinds of pictures. We will have our base set, then usually a few different activities or tricks up our sleeve to get the children to participate and have some fun to get those genuine smiles. Come trick-or-treat at our door and stay for your costume mini-session! PACKAGE DETAILS: There are several options of types of packages from prints, to collector's magnets that you get each year, to 4x4" Acrylic Blocks that you can decorate for Halloween with year after year, even after the children are grown. Then of course there are digital packages too! Any image that is included with your package will be posted in low-res to our Ell Photography Facebook album (unless you request to withhold yours), so even if you just get the magnet or acrylic block package, you'll still have one low-res digital to share with friends and family! If you order a digital package, you will receive the images promptly via Dropbox and can choose from those which to fulfill your magnet, prints, or acrylic block! SHIPPING: Shipping is included in the checkout for Halloween sessions, so please make sure to type in your valid mailing address! The fall and holidays are so busy, we find it's easiest to mail them home! 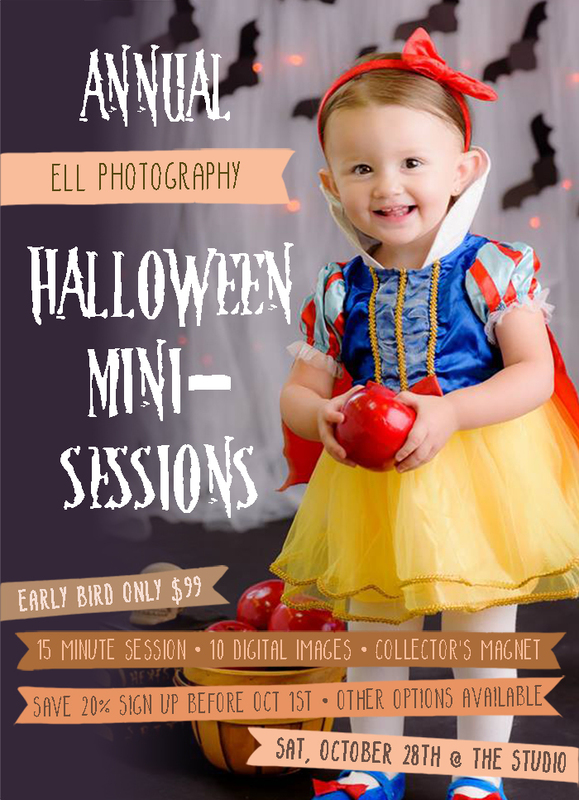 EARLY BIRD: Book your Halloween Costume Mini-Session before October 1st and get Early Bird Pricing on Digital Packages! SIBLINGS: We are excited for our 5th Halloween mini-session What we have learned from experience is that when there is more than one munchkin in a costume, there is a lot going on, and it is best if you add some extra time. Since mini-sessions are only 15 minutes, if you have more than one child and any of the children are under 6, please add an extra 15 min of time to your booking so we can capture each child at their best or good ones of them together! We don't like the "smiling or screaming" policy many studio's have for their mini-sessions. We want great pictures of them having fun! Every year there is a family that doesn't think they will need the time, but the children are overly excited for Halloween, and we have to go overtime to get good photos of them together or have enough time for individuals. We don't want to go overtime and be late for the next family, so we have made the extra time affordable. You can either add a second package if you want one product of each child to do individuals, or we can do them together and you can just add the extra time. Thank you for your consideration! SHY CHILDREN: If you know your child might take a little bit to warm up to a new situation or location, you have two options. You may come early and play in the lobby (but you may not watch in or distract prior sessions). Many families also choose to add extra time, even for just one child to make sure they are warmed up, happy, and get good smiles! HOW TO GET THE BEST PHOTOS IN A MINI SESSION: Every parenting style is different, but here is what I have learned works best to get children to participate! * Have your child try on or play in their costume the day before so you make sure it fits and they feel comfortable in it and are not scared of it since it is new (and sometimes more confining than regular clothes). * Make sure the costume is not uncomfortable. Clip any tags that might be scratchy. If there is a tulle tutu or other scratchy parts, have them wear leggings underneath, or an undershirt or onesey between the skin and the itchy part. * In general, the children will be sitting or standing, so barefeet is the best unless the shoes are part of the costume. If the child is not yet walking, please do not have them wear shoes as all we will see is the soles. * Make sure to get your child to nap appropriately for their start time and try not to give them candy, sugar, or anything new before the session that would throw their regular energy cycle off. * Maslow's Hierarchy of Needs: Make sure they are not too hot or cold, make sure they have a good meal before coming and bring water or a light colored juice (like apple juice) in case they are thirsty. ** IMPORTANT: (Again, I do not want to tell you how to parent your children, but this is my experience with hundreds of families) RESIST ALL URGES TO BRIBE YOUR CHILDREN!! If children are too young to understand bribes, they want the reward in question NOW, and do not understand later. If they do understand bribes, they generally will do the most minimum thing possible to get the reward. * Instead, try to make the mini-session sound fun and all the things they can do to act like their costume character and how their grandparents and aunts and uncles can't wait to see photos of them in their costume! Treat the session as a play-date and show them how much fun they will have! * Last but not least, if your child is a bit obstinate, or unhappy, DO NOT let them see your frustration, keep trying to make the activities fun up until the time is up. When a parent snaps, there are more emotional obstacles to overcome (fear, shame, hurt feelings & tears, anger, frustration) to get to that happy place where we get good pictures. Click Here for Your Personalized Wedding Quote! Sign up for Bridal Promotions Here! High School Juniors Apply Here! Click on the Google Connect Icon below, & Google Voice will connect you to a phone wherever I am at! Crystal & Johnathan Tie the Knot in 9 days! Pay with Cash or Credit!